Whitby Sea Anglers » Featured » Sea Angling – A Very Dangerous Sport !! Before reading this article I would like to point out that some people may find it quite upsetting. The article contains information about Sea Anglers who have been injured or even lost their lives on our coastline. Please think it through thoroughly before going any further. I hope this article can act as a reminder to anglers old and new that our beloved sport is a very dangerous one indeed, and that we must assess and manage risk wherever possible and be vigilant for the safety of others too. As sea anglers we have all witnessed that heart stopping moment when you see the lifeboat pass or the helicopter fly over. Statistics show that in relation to other high risk sports, the ratio of accidents to number of participants is very low. However the risk is there and should never be overlooked. Most of us rock anglers know someone who has been injured, and many of us know of people who have very sadly lost their lives whilst pursuing their passion of fishing from rocks, boats and even kayaks. Rough Seas At Whitby Piers. As an avid angler with a love of all disciplines within the sport Ive always wanted to encourage as many people into the sport as possible, and for everyone to have the same opportunities in the sport as everyone else. Over the years Ive witnessed a massive amount of secrecy around all parts of angling with baits and tactics being a heavily guarded secret in some quarters. The same is true of fishing marks and its always been my desire to open up the coast and its marks to as many people as possible, hence I run The Whitby Sea Anglers Website which is undoubtedly the main resource for anglers on this immediate stretch of coast.. For disclosure of marks I’ve often come in for criticism, the usual comments being about too many people chasing too few fish at the same venue. When Ive pointed out that no-one owns any part of the coast and that it should be open to everyone, then sometimes the comments turn to risk and that we shouldn’t be encouraging people to go fishing on the shore at potentially dangerous venues. Once again I feel its a matter of choice. If an individual knows its dangerous to go to the shore and fish there, and that access points can be difficult and extremely risky places to be. Then, so long as that person has full mental capacity, the choices they make are entirely there own. There are two main reasons I am writing this article. Over time I hope it can act as some form of remembrance for those of us who have lost friends in the sport. Secondly I would like it to act as a reminder of just how dangerous this sport can be. All of us can become complacent in our surroundings, but in reality we cant afford to be complacent because as we know, the sea rarely gives anyone a second chance. This is never going to be a happy article, its not meant to be. I feel great sadness in writing it. But if it helps one person stay safe on the coast simply by being more aware of dangers, then its served its purpose. In December 2013 I posted a question on our fishing forums asking individual members to outline any accidents they had witnessed or that had happened to them whilst fishing. Although I had expected a few people to of had accidents, I was quite shocked at the numbers of people who had experienced something whilst fishing locally. Slips, Trips Falls, Snapping Ropes And Broken Bones seemed to be common place. One angler explained “I Slipped on a rock at Goldsborough in an open match in 2000, just after the millennium. I Broke my shoulder blade and displaced my collarbone” – you can read more on this one here. One of the luckiest people I know, and not in terms of his catches, is my old friend Paul Lobley from Middlesborough. I know this story well as it was a friend of mine – Les Mcguire who rescued him. Paul had been walking onto the East Pier back in the days the outer extension was still open. From memory it was a foggy evening. Paul had probably gone into automatic mode having walked onto the pier a thousand times before (remember my earlier comment about complacency ?). At the point where the old stone pier dog legs, just before the lighthouse, Paul made a serious misjudgement and walked straight off the edge of the pier. In many ways Paul was lucky because the tide was out. Had it been high tide, with a big swell running, Paul would most certainly have drown in the water there and then. In other ways Paul wasn’t so Lucky. He hit the scaur below very hard. So hard in-fact he broke many bones. Screaming for help and with an incoming tide, Paul dragged himself to the old Spa Ladder which was a bridge that connected the pier to the Haggerylthe above. There was no Ramp and walkway down to the pier in those days. Paul found himself at the bottom of the spa ladder laid in water with the tide coming in. There was no way over the spa ladder for Paul, it was too high to climb with his sustained injuries. Once again Luck was on Paul’s side that night, someone was looking out for him. My good friends Les and Rose Mcguire lived on Sandside back then. They had gone to bed earlier but Les had been watching Match of The Day on tv. It was a warm Saturday night and Les had left the bedroom window open. As the football finished on TV, Les had got out of bed to turn off the TV and close the bedroom window. Les described to me, hearing a faint shout for help which Rose had felt would be the towns youngsters messing about on Tate Hill Beach as they do most Saturday nights. Thankfully Les decided to go out and look, and as he got on Tate Hill Beach he saw it was empty there, but he could here Pauls screams for help. Les quickly went back home to tell Rose to get the police, Ambulance, Coastguard etc, then he went to find the person clearly in distress. Thankfully Les found Paul and effectively saved his life. The emergency services came and took Paul to Hospital. Although not a funny situation but Rose did make me chuckle when she explained Les later came past on a second stretcher and was carted off to hospital himself in the middle of an asthma attack. Poor Les was a lifelong Miner and suffered coalminers lung as his reward from Maggie Thatcher for his lifetime of effort in the mines. So theres another story of near tragedy. Speaking to Paul recently I know he still suffers the pains related to that accident to this day. But thankfully he survived and went on to catch many more cod since that horrendous day in his life. Like all true rock anglers, the fall never put him off and he has been back on the pier and rocks many times since that day, Several other anglers haven’t been so lucky. To diversify slightly, the risks of angling are not only found in Rock Angling. There are many stories of accidents amongst boat and kayak anglers. Over the years Ive heard stories of anglers having heart- attacks miles from shore whilst out charter fishing. Other anglers have been caught out by the weather whilst out in their boats or kayaks. You can always find sympathy for the local angler who didn’t recognise the poisonous weaver fish and then went into anaphylactic shock on his kayak at Runswick Bay once it stung him. Conversely its difficult to find any sympathy at all for the idiot who came from inland and tried to kayak out of Runswick Bay in a 9ft Northerly Swell. Later saying to the lifeboat team who rescued him “Well I came all the way here and felt I should give it a go”. In my eyes these are the sort of people who give us all a bad name. Im now going to write about the saddest part of our sport. The Days we loose someone. Im sure most anglers from our immediate area will be very much aware of the sad loss of Nigel Savage from the cliffs where he had been fishing near Cloughton. The post on our forum does not make for happy reading but its does outline the events pretty much as they happened that day. The post to the forum by Andy Barmby from Bridlingon perhaps being the most chilling to read. It brings a tear to my eye now as I read it through. – “I have just been talking to crazy horse’s (Nigel’s) wife and it is him who is missing – Nigel Savage. He failed to come home at 9.30 last night and the police /coast guards found one of his dogs at the top of the cliffs near his rucksack and his other dog on a ledge nearby. Im not quite sure exacatly where this happened but it sounds like he was between Burniston and Cloughton. The police and coastgaurd are still searching for him. I hope he is cuddled up under the cliffs somewhere. Sadly Nigel was never found. He is sadly missed by the local angling community. His good friend Andy Barmby runs several charity events each year in memory of Nigel’s life. When an angler dies, all of us feel the pain deep inside, I know I am at this moment in time going back through these old forum posts. Details of some other tragedies on the coast can be found in a recent forum topic on the subject at this link here. 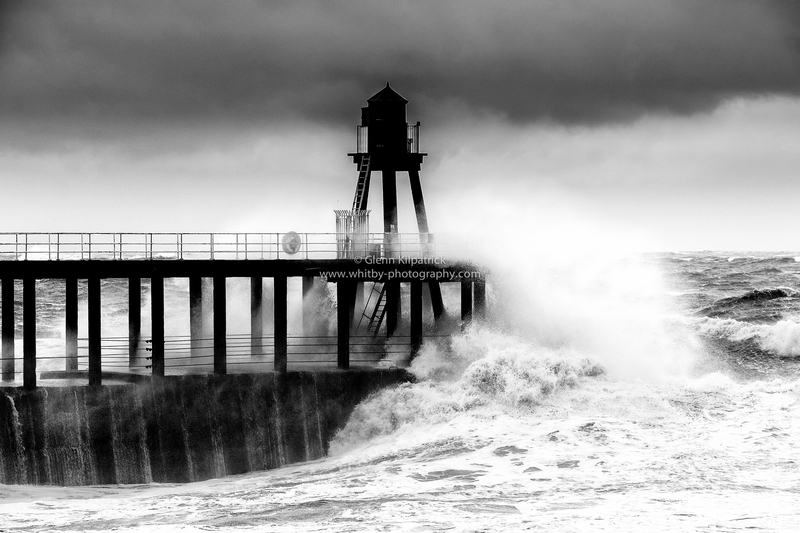 Rough Seas At South Gare By Andrew Dawson. This venue has accounted for several anglers lives over recent years. I hope my article hasn’t put anybody off becoming involved in our great sport. As I mentioned earlier, I want to encourage more of you to get out there, not less. There is no better feeling in life than visiting the coast and pitting your skills against the elements. But while doing so please just keep in mind the dangers, and try as much as you can to minimise them. Please keep a look out for each other whilst out there. Some other things to bare in mind with regards to keeping yourself safe. It is pointless me telling you not to use the ropes on the cliffs. I know a lot of anglers do this daily, and a lot more of you want to give it a try. Despite having fallen off the ladder at North Hawsker I still use the ropes to access the shoreline below cliffs. Please check anchor points and make sure the ropes are as safe as possible. Better still take your own safety gear and clip on if you can. Always remember Paul Kilpatricks Forum post here – where he explains how someone had untied a rope from its anchor point at highlights. Had he put weight on the rope that day he would have fallen down the cliff, likely to his death. Although cliff top fishing is relatively safe and most of you wont listen to anyone who tells you otherwise, just be vigilant whilst cliff fishing. Don’t fish overhangs, watch out for cracks in the cliff edges, and be aware that the cliff is extremely prone to falling after heavy rains. Always remember there have been deaths of anglers fishing on Cliff Tops. Keep in mind that some venues are extremely dangerous, and being there in the wrong conditions could cost you your life. Seek local knowledge wherever possible, and if in doubt don’t go there. Some very dangerous marks are outlined on our forum here. Even experienced anglers come unstuck. When you get them big storms with long distance swells rolling down the north sea, you can get extreme surges. Ive seen the water retreat a hundred yards before rushing back in and washing anglers off their feet. One wonders if popular angler Barry Tweddle lost his life this way. I remember the night in question was very heavy indeed. Minimise the risk of slipping on Scaurs by wearing studded waders or boots. Something the coastguards are pushing a lot these days. Consider wearing a lifejacket even for Rock Fishing. I know a lot of the time its completely not feasible, but if at all possible just give it some thought, especially for children. There’s an element of danger in all walks of life..it’s about being observant, …willing to listen to the right people, and most of all don’t try to mess with nature ,or something you know very little about …there will only ever be one winner and it wont be you………mick. Great input there Mick, many thanks form contributing.